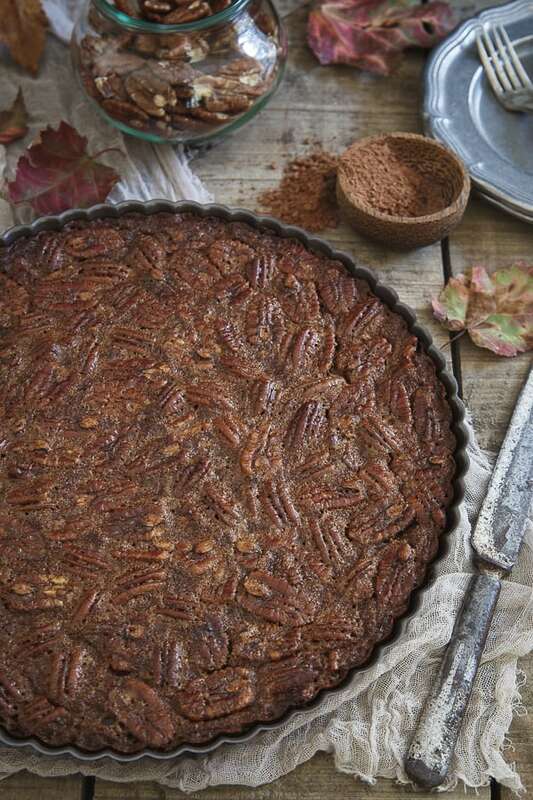 This paleo chocolate pecan tart is part brownie, part pecan pie, every bit delicious and just begging for a spot on your holiday table. You won’t believe how decadent it is! A couple of months ago, I found myself seated at a lunch table for about 20 in a detached garage like side building of an Amish person’s house in the middle of Ohio. I’ve had Amish food before (having gone to college in the heart of central Pennsylvania, there was plenty of that) but I’ve never had quite as authentic a meal as this lunch. After 2 rounds of chicken, pulled beef, green beans, mashed potatoes and the most amazing homemade bread I’ve literally ever tasted, we dug into dessert. Set out on the table were different plates of 3 types of pie: an apple oat crumble, a fluffy peanut butter pie and a traditional pecan pie. I honestly thought I’d be all about the apple oat crumble, fruit pies are way more my style, but just as I was about to lay my fork down for the day, I decided to take a little bite of the pecan pie. It was sticky, sugary, melt in your mouth buttery and pretty much a heart attack/artery clogging piece of amazingness. I don’t even really like pecan pie and I’ve been thinking about it every day since. So much so that I decided it needed to be inspiration for a paleo version. Let’s get something straight with this recipe, just because it’s paleo folks, does not mean it’s healthy. There may not be refined sugar in this, but there’s enough maple syrup, coconut sugar and fats from all the nut flours in the crust to pretty much fill (or more likely, exceed) your daily quota for all those things in just one slice. That said, it’s worth every calorie-filled bite, trust me. The chocolaty tart crust gives the pie an almost brownie (paleo brownie that is!) like bite on the bottom with all the sticky sugar filled goodness you expect from a pecan pie on top. The richness of each bite will literally leave your taste buds begging for more while the whispers for help from your waist line get ignored by that “it’s the holidays, I deserve to indulge” devil on your shoulder. My advice to you, listen to the devil this time around. 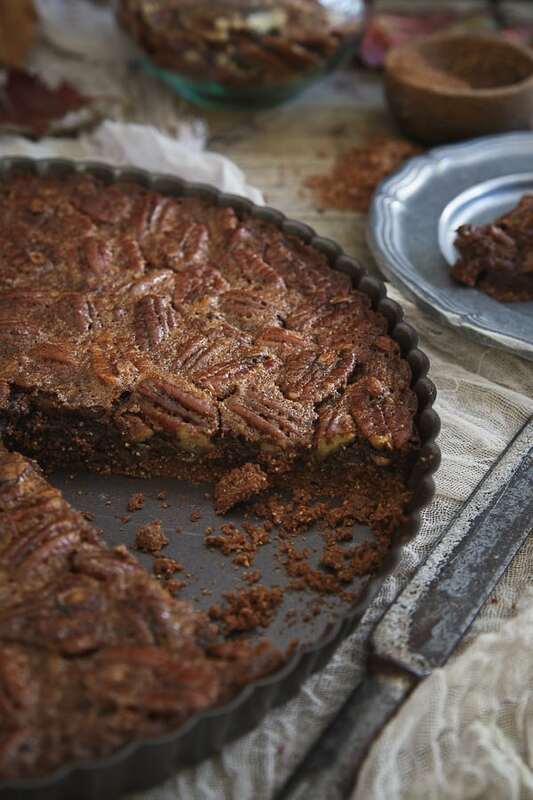 Check out this paleo chocolate pecan tart recipe over on Food Fanatic’s website too! I wouldn’t be able to eat just one slice of this tart! The almond chocolate crust sounds delicious. I love that it is part brownie, part tart too! I can just taste this, love it. I love that this has a brownie crust! Im going googly-eyed for that brownie crust!! What a genius idea! Holy moly, that chocolatey, brownie-like crust. A.MA.ZING. 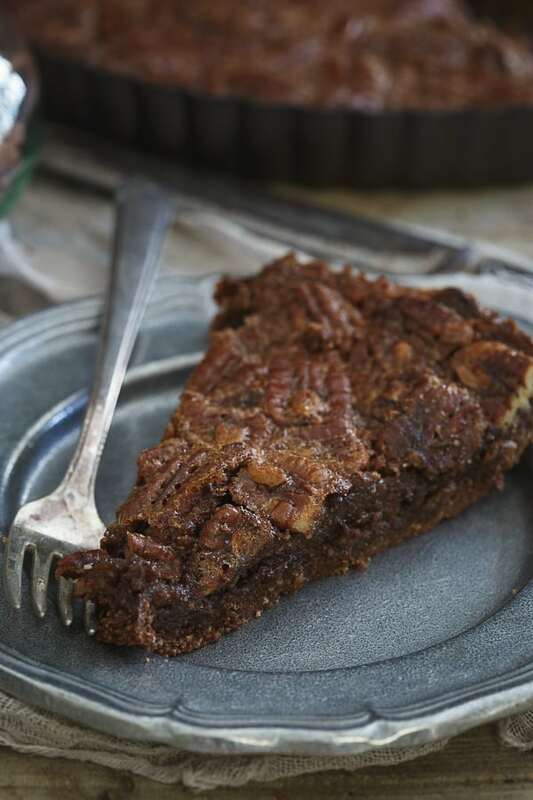 I love pecan pie but adding a little chocolate decadence to it just won me over, BIG time. Plus I LOVE LOVE LOVE that you’ve made it paleo!! Great googly moogly that looks good! Looks AMAZEBALLS (and I hate that “acronym” – seriously, is it even a word? – but it totally applies here). Can you sub ghee or lard or palm shortening for the butter in the filling? I’m trying to avoid dairy (except for ghee). Thanks! I can hear that devil’s voice loud and clear — this is spectacular!